Click here to read "The Grand Old Man of Orangeburg: Wofford's First Graduate." This is an excellent biographical piece about Samuel Dibble which appears on the Wofford College website. This photograph of Samuel Dibble and Mary Christiana Louis was taken on their wedding day, November 10, 1864, less than three weeks after Lt. Dibble was released from Johnson's Island. Lt. Dibble rejoined his unit in early December 1864 and was later recaptured at Town Creek, North Carolina, in February 1865. "It is proper and useful to keep alive the memories of a past of which we need not be ashamed, and to impress upon the youth of our land the significance of the great struggle for Southern rights, and to set before them true pictures of the deeds of a generation fast pasing away. . . . We who are survivors endeavor to recall and relate to each other facts and incidents of a period of war, and we tell these to our children and to those who were then unborn, not in a spirit of vain-glorious boasting, exaggerating the importance of every trivial episode, such as the world never saw before and can never see again -- but simply to let the truth be known of sacrifice made that ought to have been made, of hardships endured that ought to have been endured, and of acts of courage which any brave man would do under similar circumstances." Between 1862 and 1865, approximately 9,000 Confederate prisoners of war passed through the gates of Johnson's Island. Although Johnson's Island originally housed both officers and enlisted men, it was reserved for officers for the vast majority of the war. One of these officers was Lt. Samuel Dibble of South Carolina, my great-great-grandfather. During his stay at Johnson's Island, Lt. Dibble collected autographs from his fellow prisoners of war. Lt. Dibble's autograph book has remained in the hands of his family and, with the exception of a brief period when it was displayed in a Lancaster, S.C., museum operated by my late father, its existence has been largely unnoticed. In the Spring of 2001, while sorting through some family personal effects, I rediscovered this autograph book. Although myself and others who have seen this book were immediately (and perhaps superficially) struck by the sheer elegance of the writing style of many of the autographs, we very quickly sensed the historic nature of the book and the great sacrifices which those who signed the book endured. Although the book likely does not contain any information which is not otherwise available in some manner, it does provide confirmation of the presence of many Confederate soldiers at Johnson's Island. In the spirit of Samuel Dibble's remarks, I have published the contents of the autograph book on this webpage. I hope that you find this website to be informative. 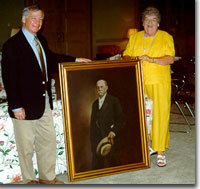 In June 2000, Caroline Emanuel -- Samuel Dibble's great-granddaughter -- presented a portrait of Samuel Dibble to Wofford College President Benjamin Bernard Dunlap. In 1856, Samuel Dibble became the first graduate of Wofford College. 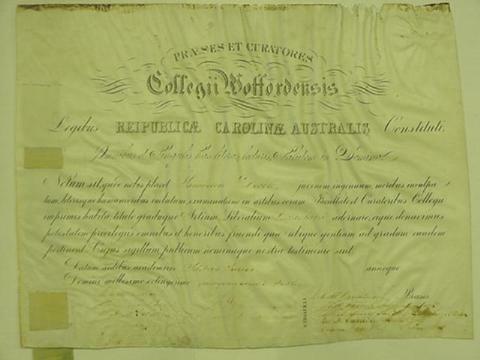 His diploma is shown below. There are 221 autographs in the book. Of these 221, 1 was by a member of the Confederate Navy who survived the sinking of the HL Hunley (Lt. Charles Hasker). South Carolina had the most signers of the book (56), followed in order by Tennessee (35), Arkansas (21), Virginia (19), North Carolina (15), Mississippi (14), Alabama and Kentucky (11 each), Maryland (9), Missouri (7), Louisiana (6), Georgia (4), Texas (3), Florida (2), and Arizona (1). Confederate Generals Wm. N.R. Beall, I.R. Trimble, M. Jeff Thompson, J.J. Archer, J.R. Jones, and J.W. Frazer all signed the book. This site was created on June 8, 2001, and was last updated on January 18, 2007.